The Ossington Strip of today is much different from when it all started back in the late 1700's. It has transformed itself into a bustling restaurant scene with some of the cities most notable chefs' at the stoves. A huge hit with millennials, the strip offers something for everyone, from a craft brewery to tapas bars, cocktail lounges, live music venues, a butcher shop by day, wine bar by night and of course, and an amazing food scene. Your jovial guide will give you the inside scoop on the hood as you learn about its somewhat dark history and its connection to the Martin Luther King assassination. This progressive dinner will take you to three different restaurants where you will order four dishes to be served family style. By the end of the night, you will have tried 12 dishes and a variety of adult beverages to accompany your meal. If you're a cocktail lover be sure to order the cedar smoked, bacon infused old fashion. It is epic! Your guide will be waiting for you when you arrive at the north-west corner of Queen St. West and Ossington. After a brief history lesson of Toronto, we head off. As you walk along the Ossington strip your guide will tell you stories of another time when Ossington was a seedy, crime-filled derelict neighborhood and the tremendous changes over the last 10 years that has seen the area morph into one of the trendiest neighborhoods of the city. See where world-famous boxer Muhammad Ali's trained and where James Earl Ray hid out after the assassination of Martin Luther King. 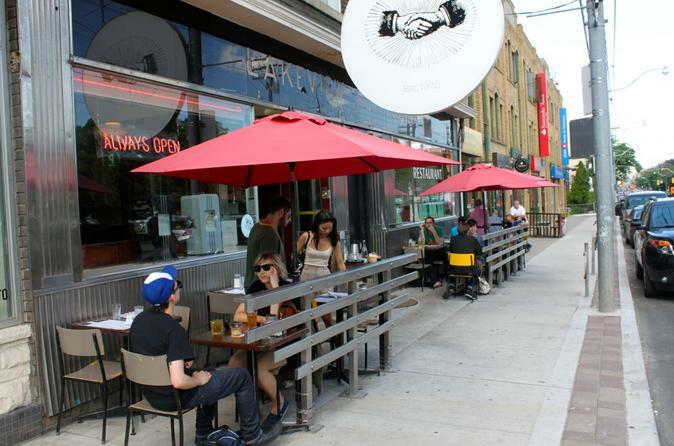 On this culinary experience, you'll see some of the best restaurants along the trendy Ossington Strip. Each restaurant has been hand selected by our founder and chief eating officer, Chef Scott. During the evening, you will taste a total of 12 different dishes served family style and paired with sake, wines and cocktails. Tour runs approximately 4 hours.